A correspondent told me a few years ago about a remarkable example of birds’ dealing with the cold. “Recently, on a day when outside looked very white as snow was falling and already covering the ground, my husband and I witnessed a burst of color. Late in the afternoon, we saw about eight bluebirds sitting in the tree near our birdfeeders. Much to our surprise, some of them visited our feeders. This was our first experience at seeing bluebirds do this so we knew they must be very hungry. A number of species practice communal “bundling,” as the old New Englanders called snuggling on a cold winter’s night, but this was the first time I’ve heard of bluebirds doing it. 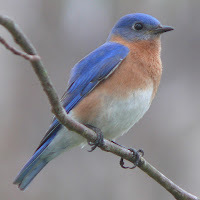 A check of Arthur C. Bent’s venerable and huge (21 volume) series, Life Histories of Familiar North American Birds, provides some interesting accounts of bluebirds in similar situations. Bent quotes an item in a 1937 Springfield, Mass., newspaper, "Mr. Cross of Huntington has a photograph of 22 bluebirds together which, caught in a heavy spring snowstorm, lived upon sumac berries and, between feedings, snuggled together, all fluffed up, on a small dead branch in the shelter of a building." Bent quotes Edward H. Forbush reporting in 1929, "In western Massachusetts and in Vermont during the late spring storms, many bluebirds have died huddled together in hollow trees, where they sought refuge from fury of the gale. During a storm, a lady in Stowe, Vt., heard a bluebird calling in her living room and found two in the stove. They had sought shelter in the chimney and had come down the stovepipe." But perhaps the most amazing story – if it can be believed – came from that 1937 Springfield newspaper: "On March 28, a pair of bluebirds came to the feeding station of Charles J. Anderson, 24 Eddywood Ave., Springfield, and after eating began to flutter and peck at the window. It was cold outside, so after talking to them through the glass, Mrs. Anderson let them in. The male was hardy, but the female manifestly required warmth. She was given warm milk to drink, and warbled her thanks. For three days, while the cold spell lasted, she returned periodically to get warm inside the room."